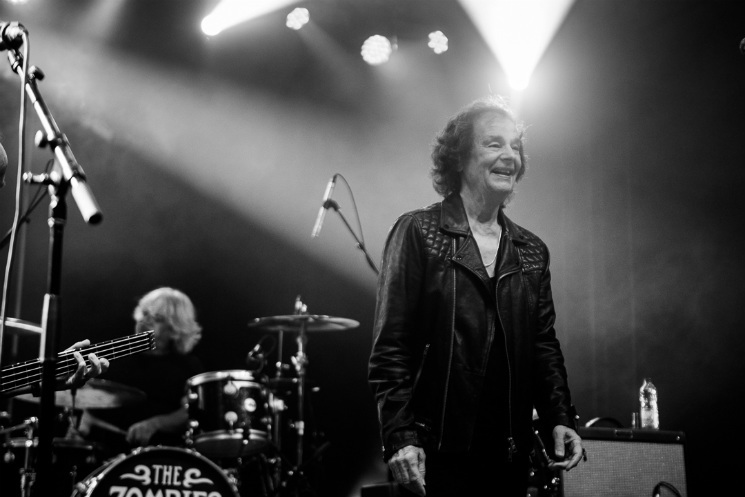 On tour to support the 50th anniversary of their irrefutable classic Odessey and Oracle LP, The Zombies made a stop at Ottawa's Bluesfest for a Tuesday night (July 11) third-stage headlining performance. Returning to the city for the first time since their appearance at the same festival in 2009, original members Colin Blunstone and Rod Argent, along with current Zombies members — bassist Jim Rodford, his brother Steve on drums and Tom Toomey on guitar — managed to once again draw a sizable legion of predominantly aging fans to the festival's tented stage. Decked out in matching black leather jackets, the quintet looked energized and grateful, opening the evening's set with their 1965 B-side, "I Love You," as Blunstone showed the crowd just how well his voice has held up, especially during the song's vocal-stretching post-chorus. Cleverly getting a duo of tracks ("Moving On" and "Edge of the Rainbow") from their latest LP, 2015's Still Got the Hunger out of the way early, the band launched into a mini-set of songs from Odessey and Oracle, including "Care of Cell 44", "This Will Be Our Year," the Argent-sung "I Want Her, She Wants Me" and "Time of the Season," with the latter causing the crowd to simultaneously pull out their phones (and iPads) to snap photos and take video of the band performing the mega-hit. After a joyous rendition of their 1964 single "Tell Her No" and covers of the Miracles' "You've Really Got a Hold on Me" and Sam Cooke's "Bring It On Home to Me," Rod led the band through a boisterous rendition of his '70s band Argent's hit "Hold Your Head Up," as the organist hammered out a brilliant extended solo that managed to ramp the energy of crowd to a near-boogie. Closing the evening off with their biggest hit, "She's Not There," Blunstone and Argent (now in their early 70s), left the festivalgoers after a flawlessly crafted stage show that highlighted the best of what the Zombies (and Argent) gave to rock'n'roll.